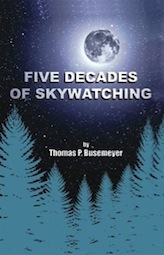 An architect by profession, the author Thomas P. Busemeyer, was hooked on skywatching - a habit, he said that hooks you forever. He wrote this books in hopes that other amateur astonomers, casual skywatchers and would-be skywatchers would find it interesting and informative. Thomas' observations were collected in their narration of observations of celestial objects and events seen at various times under various conditions. In this work, he strongly advises any serious amateur astronomer to keep a log of observations for enjoyment and to allow for comparisons as well as to revive memories of pleasant and maybe not so pleasant observing experiences.